The MA in Writing at Warwick is one of the most successful and highly-rated programmes of its type in the world. You will be joining a supportive and flourishing creative community, recognised for its academic excellence, with a packed programme of events and workshops through the year. You will develop your writing in a way that is geared towards your future professional life, whether in full-time authorship or in professions such as publishing, the media, or teaching. The Warwick Writing Programme is intended for experienced as well as ambitious writers, whether published or not. You can take the course full-time for a year, or choose to study part-time over two years. You will have an unusually broad range of modules and training open to you: from literary fiction and poetry, through human rights writing and translation, to science fiction, fantasy, and the historical novel. You will be working alongside practising, award-winning novelists, poets, and writers: our teaching staff includes A.L. Kennedy, Sarah Moss, Tim Leach, Michael Hulse, Will Eaves, David Vann, Maureen Freely, Jonathan Skinner, Andrew Williams, Preti Taneja, Gonzalo C. Garcia and David Morley. We teach in writing workshops, seminars and one-to-one supervisions. Most modules are assessed by portfolios of writing in the relevant genre, sometimes with an accompanying essay. Space for reading, thinking and writing matters almost as much as teaching. Our campus is a good place for writers, with a wide range of creative spaces and events open throughout the year. Each year, the MA group produce an anthology of new writing derived from work done during their time at Warwick. The latest volume, Moonshine, was lauched at an evening of celebratory readings at the Piccadilly branch of Waterstone's in June 2017. You will get the chance to be involved in the production, editing, writing, and promotion of a new anthology, seeing your work in print and gaining some invaluable hands-on experience along the way. Our staff have excellent links not only with other writers but also with publishing houses, literary journals and agencies, with national and regional organizations such as the Arts Council, PEN and the Royal Literary Fund, and with other creative writing schools both in Britain and in the USA. Our ‘Work in Progress’ series gives an opportunity for writers – including Warwick staff - to read from and discuss their current projects. Many of our alumni have forged highly successful writing careers and picked up major national and international prizes: recent examples include Sophie Mackintosh's novel The Water Cure, Katy Whitehead winning the 2017 Fitzcarraldo Essay Prize, and Sohini Basak's debut collection We Live in the Newness of Small Differences winning the 2016 Beverly Series. In addition to the usual application materials, candidates will be selected on the basis of a personal statement and a portfolio of their written work. The portfolio should be around 5000 words of poetry or fiction, or a combination of the two. You must upload this with your online application form. From 2017, we are working in partnership with The Sunday Times and the literary agency Peters Fraser & Dunlop on the Young Writer of the Year Award, whose previous winners have included Zadie Smith, Sarah Waters, and Simon Armitage. With the Warwick Arts Centre, the Writing Programme also helps to organize Writers at Warwick, a weekly series of public readings and talks by visiting authors throughout the academic year. More than 300 writers have appeared in the series since 1997, among them Monica Ali, Martin Amis, Julian Barnes, A.S. Byatt, Umberto Eco, Bernardine Evaristo, Michael Frayn, Christopher Hampton, Tony Harrison, Nick Hornby, Linton Kwesi Johnson, Hanif Kureishi, Hermione Lee, Doris Lessing, Mario Vargas Llosa, David Lodge, Ian McEwan, Andrew Motion, Tim Parks, Michèle Roberts, Salman Rushdie, Will Self, Wole Soyinka, Meera Syal, Derek Walcott, Marina Warner, Fay Weldon, Edmund White, and Gao Xingjian. Warwick also regularly hosts international conferences and public debates on writerly topics, which have included Censorship, The Needs of Writers, Minority Cultures and the Establishment Press, Science Writing, Creativity, Women in the British Theatre, Writing for Children and Journalism and Public Policy. For further information and details of how to apply, email the MA in Writing Admissions Tutor, Professor Sarah Moss. 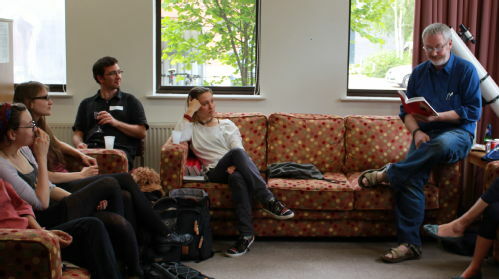 Warwick Thursdays is the Writing Programme’s weekly literary salon, organized by Writing Programme staff in conjunction with the Masters students and featuring visiting novelists, poets, dramatists, filmmakers, publishers, editors, agents and artists in conversation with Warwick writers. On the MA you will be encouraged to get involved with this and many of our other events and activities.